This week, the "Wayne Ivey for Sheriff Campaign Team" announced that Brevard County Sheriff Jack Parker endorsed former Resident Agent in Charge Wayne Ivey from the Florida Department of Law Enforcement in his candidacy for Brevard County Sheriff. “Wayne Ivey is an outstanding law enforcement officer who has made a real difference in Brevard County and the State of Florida. Wayne's 30 plus years of law enforcement and leadership experience, coupled with a devout passion to help, is absolutely essential to address today’s complex public safety challenges," Sheriff Jack Parker said. "Wayne has played a critical role in creating and implementing innovative partnerships like the GAMEOVER® Task Force and has focused on removing violent criminals from our communities and protecting our children. He is also nationally recognized for his leadership, knowledge and investigative efforts as related to Identity Theft and Fraud, which will be a very important asset for the next Sheriff as financially related crimes are one of our nation’s most pervasive problems. Wayne is deeply invested in every aspect of our community and continues to serve on many non-profit boards in an effort to assist at-risk children and others in need of help. When I look at every major quality a person needs to possess to be an excellent Sheriff, Wayne has them all. I have every confidence that Wayne Ivey will be an excellent Sheriff and will continue to build on the successes of our strong Sheriff’s Office. Please join me and my family in supporting Wayne Ivey and let’s work to make him Brevard County’s next Sheriff." 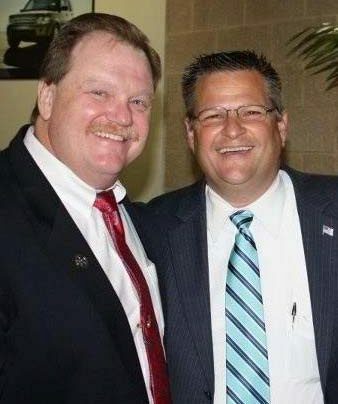 "I am truly honored to have received the endorsement of Brevard County Sheriff Jack Parker. Sheriff Parker is an outstanding and accomplished law enforcement leader who has served and protected Brevard County in an exemplary manner," replied Wayne Ivey. "As the current Sheriff, he knows firsthand the personal and leadership qualities needed to excel as our county's Sheriff; and his support and personal endorsement means a great deal to me and my family. I wish Sheriff Parker the absolute best in his all of his future endeavors!" Wayne Ivey has previously received the endorsement of hundreds of Community Leaders and Brevard County Law Enforcement Officers, to include Florida Agricultural Commissioner Adam Putnam, FDLE Commissioner Tim Moore (ret. ), Florida House Representative Steve Crisafulli, Colonel Danny McKnight USA (ret. ), former Sheriff's candidate and BCSO Sergeant Gary Harrell and the strong support of current and former Brevard County Chiefs of Police. To view all of the endorsements, visit the endorsement page at ElectWayneIvey.com.